We recently added inquiry support for five more listing sites. Here is a quick walkthrough on how to make your VRWD inquiries show up in OwnerRez. First, open the instruction page in the inquiry area. This will show you your assigned @inquiryspot.com email address for each of your properties in OwnerRez. Then, head over to VRWD and login. After logging in, you'll see your properties listed on the VRWD control panel homepage. Click on the Details button for the property you want to integrate. In the property details, you'll see an 'Email' field which contains the email address that VRWD sends inquiries to for this property. 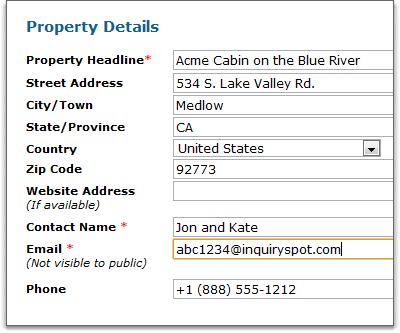 Put your @inquiryspot.com email address in that field. Then click the 'Update Your Listing' button at the bottom of the page to save the new email address. As always, be sure to send a test inquiry to yourself by opening your property listing on VRWD and filling out the inquiry form. When it arrives in OwnerRez, you'll know the integration is complete. If you need to integrate all your properties, you'll need to go property-by-property updating each one at a time. 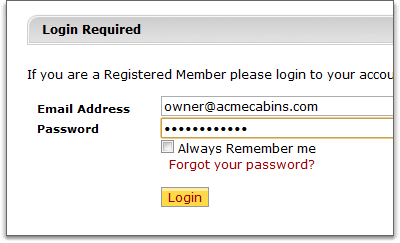 There is no way to update multiple properties at one time.